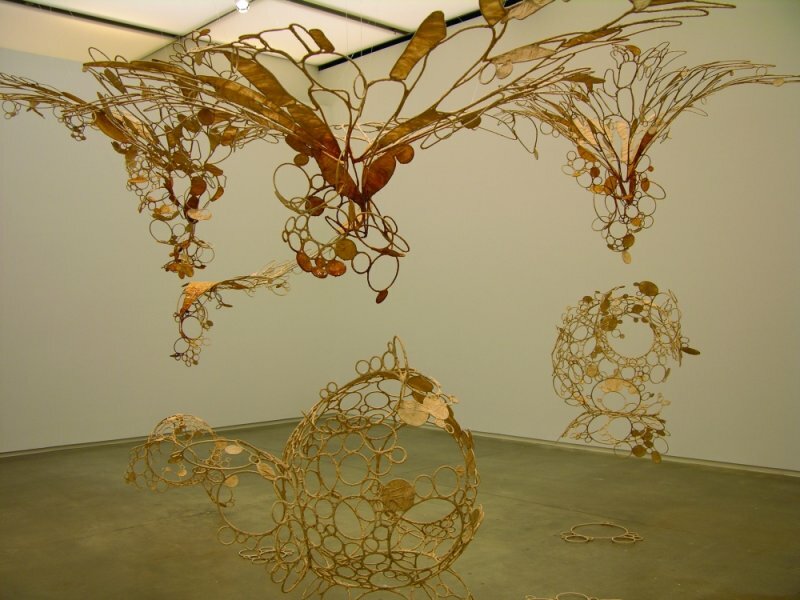 Ranjani Shettar creates large-scale, abstract sculpture by combining manmade and natural materials such as wood, beeswax, cloth, thread, rubber, PVC pipe, wire, steel, and beads. Her works, which appear to be as impulsive and random as they are patterned and logical, are frequently arranged as sculptural installations that interact with and articulate the space around them. Evoking sweeping, curving, drooping, and growing organic life forms, but leaving the machined elements exposed, Shettar’s installations investigate the intersections between the natural world and the evolution of humankind. Her choice to use industrial materials coupled with the reductive methods she employs connects her to the Minimalists, who favored prefabricated, repetitive forms. Yet, the obvious handmade and labor-intensive quality of the artist’s installations relates to her Eastern upbringing. Born and currently living and working in Bangalore, India, Shettar’s work is influenced by her culture: its craftsmanship and use of natural and found materials, as well as its symbolism and philosophy; a philosophy that is grounded in the animate possibilities of all materials. Some of the artist’s most notable works are the webbed, beaded hanging structures that are at once gridlike and fluid, such as the network of beeswax and thread that comprise Just a bit more, 2005–06, which was featured in this year’s 55th Carnegie International (Life on Mars). In Just a bit more, blue beads sparkle and quiver slightly in their delicate web to create a stunning, room-size installation. With this piece and much of her work, the idea of part-to-whole is fundamental and the fluctuation between seeing the work as humble and then spectacular is a strong aspect within this dynamic. “When a sculpture is hanging, gravity has a huge role in creating both tension and flexibility,” Shettar explains, “which becomes the shape of the work.” Another important suspended piece included in this exhibition is Sun-sneezers blow light bubbles, 2007–08. Made of stainless steel, muslin cloth, tamarind kernel powder paste, and lacquer, the forms have the same shimmering, kinetic quality that characterizes Just a bit more. The framework of Sun-sneezers is stainless steel, but by wrapping it with a golden-colored muslin cloth that has been fitted over the interconnected, looping steel forms, it defies its own tough understructure. Instead, the multiplying, circular forms–as the title suggests–appear to be as fragile and fleeting as bubbles as they trickle to the floor from the ceiling. Made with unassuming materials and intensive handwork, Shettar’s sculptural installations broaden the scope of our visual field, to include, for example, an image of an invisible atmosphere. Recycling and reworking existing forms, she also underscores the adaptability of materials and their potential for numerous identities throughout one life cycle. Ultimately, however, it is by stripping objects and materials from their predictable contexts and adding elements of humor, philosophy, symbolism and spirituality, that Shettar elucidates the extraordinary essence of everyday forms. Shettar was born in 1977 in Bangalore, India, where she lives and works today. Her installations have been included in a number of international exhibitions, such as Life On Mars, 55th Carnegie International, Carnegie Museum of Art, Pittsburgh, 2008; the 9th Lyon Biennial, France, 2007; the 15th Sydney Biennale, Australia, 2006; and How Latitudes Become Forms: Art in a Global Age, Walker Art Center, Minneapolis, 2003. In 2006, Shettar was an artist-in-residence at Artpace in San Antonio, Texas. After FOCUS: Ranjani Shettar, the artist will open a solo exhibition at the San Francisco Museum of Modern Art in spring 2009. The Director’s Council was formed in 1985 to assist the Museum with acquisitions. Council members enjoy a varied program of special events, and a portion of the Council’s annual membership dues are donated to an acquisitions fund. The culmination of the season is a Purchase Meeting, at which Council members purchase a work of art for the Modern’s permanent collection. This group provides members with an ambitious, creative approach to understanding collecting in today’s art market. Special events and programs exclusively for the Director’s Council begin each fall. The Director’s Council FOCUS series features three solo exhibitions organized annually by Curator Andrea Karnes. Each exhibition opens with an exclusive cocktail reception for Council members, an opportunity to meet the featured artist and discuss his or her work. One work by each artist will be chosen to be part of the final Council selections. At the season’s Purchase Meeting, the Council selects one work to enter the Modern’s collection. This format creates an in-depth understanding of the Modern’s acquisitions process and provides a spirited and popular series of events. The annual dues, $525, include all the benefits of a Family membership and invitations to exclusive Director’s Council events.